The opening of the demonstration home on July 4. A new ‘dementia-friendly’ home has been developed jointly by leading building science research centre, BRE, and experts from Loughborough University. The building aims to educate housebuilders, carers and relatives on how to better support those living with dementia. Its design is geared to help dementia sufferers remain at home for longer than in a normal home, thus dramatically improving quality of life and reducing the cost of care to the state and relatives, which is estimated to be around £30,000 to £40,000 per annum per case. The £300,000 project has been designed by HLP Architects, and is based on the ‘design for dementia principals’ previously developed by Dr Rob McDonald at Liverpool John Moores University and Bill Halsall of HLP Architects. It will also be used to assist Loughborough University’s ongoing research into how the features are used, with a view to further improving ways to support homeowners with dementia. 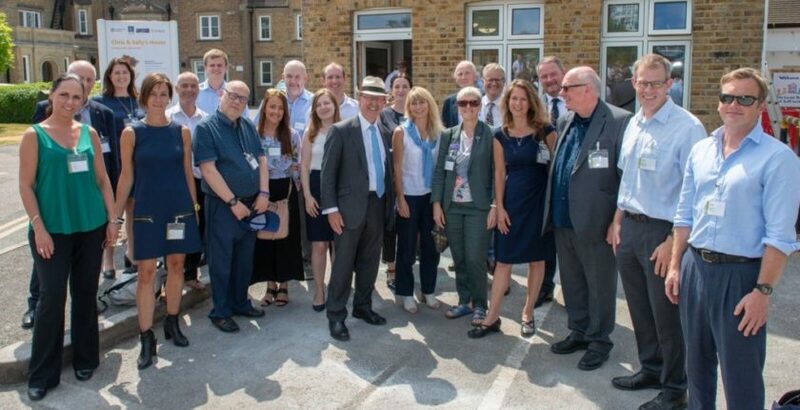 The home was formally opened by Lord Richard Best OBE DL, Co-Chair of the All-Party Parliamentary Group on Housing & Care for Older People on the BRE Innovation Park in Watford on 4th July 2018.